Counterfactual history (asking, and attempting to answer, “what if?” questions about the past) does not enjoy academic respectability, despite the efforts of imperial apologist Niall Ferguson to establish “virtual history” as a legitimate scholarly enterprise. It has recently been lambasted by Richard Evans, and indeed it does seem to be the case that the genre largely consists of “the byproduct of a paranoid nostalgia specific to the right”. But it has always seemed to me that counterfactuals must lie at the heart of understanding causation: to state that “X caused Y to occur” is to imply that “without X, Y would (probably) not have occurred”. So why not embrace and elaborate upon these implications? 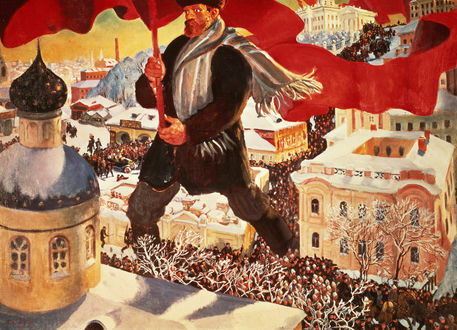 I will write more thoroughly about the whole idea of counterfactual history in due course, but here is some food for thought in the form of ten possible counterfactual questions about the Russian Revolution and early Soviet history, which should at the least succeed in replacing right wing fantasies with left wing fantasies. Can anything be salvaged from the whole idea of “virtual history”? 1. What if Nicholas II had embraced reform after 1905? 2. What if Russia had not fought in the First World War? 3. What if Lenin had died on his sealed train? 4. What if Zinoviev and Kamenev had prevailed in autumn 1917 and the Bolsheviks had followed the strategy of socialist coalition? 5. What if Germany had won the First World War in 1918? 6. What if the communists had triumphed in Germany? 7. What if the party had rejected Lenin’s New Economic Policy? 8. What if Lenin had lived long enough to dismiss Stalin from his posts? 9. What if Bukharin and the Right had prevailed over Stalin in 1928-9? 10. What if Kirov had ousted Stalin in 1934? This entry was posted in Historiography, Russia and tagged communism, historiography, history, Lenin, Russia, Stalin, Trotsky, Tsarism, WWI by therationalcolonel. Bookmark the permalink.